Brian Clough's twenty years as Nottingham Forest manager were an unpredictable mixture of success, failure, fall-outs and alcoholism. Duncan Hamilton, initiated as a young journalist into the Brian Clough empire, was there to see it all. In this strikingly intimate biography - William Hill Sports Book of the Year 2007 - Hamilton paints a vivid portrait of one of football's greatest managers: from Nottingham Forest's double European Cup triumph to the torturous breakdown of relations at the club and Clough's descent into alcoholism. Sad, joyous and personal, Hamilton's account of life with Brian Clough is a touching tribute to a brilliant man. Duncan Hamilton was a journalist at the `Nottingham Evening Post' for over twenty years. 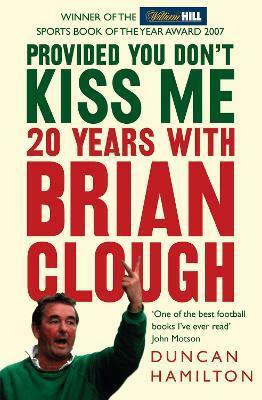 `Provided You Don't Kiss Me: 20 Years With Brian Clough' was published to great acclaim in 2007 and won the William Hill Sports Book of the Year Award. He now lives and works in Leeds.